There is always more than one story behind every horse. Be it the owner, breeder, trainer or the strapper and all are just as important and they are all responsible for the racehorse we watch dive at the finish line with bated breath, exhaling a sigh of relief, closely followed by an exhilarating cheer!! It’s been a great beginning with four starts for two wins & two seconds for trainer Greg Eurell, O’Tauto’s breeder & owner of Larneuk Stud, Neville Murdoch and for his dedicated strapper Claire Skerman. Halfway down the famed Flemington straight, he had several lengths to make up, but he changed legs, pinned his ears back and lengthened his impressive stride. O’Tauto was in front where it counted, putting his nose out on the line. It was start number four for the exciting Greg Eurell trained three-year-old who had created such a fine impression saluting in determined fashion at his Cranbourne debut. Stepping straight up to BM70 level at Flemington next time out, O’Tauto caught the eye with a gallant second, and deservedly started favourite in the Furlong Bar Handicap. Settling back O’Tauto looked a little too relaxed, but once into the straight when Damian Oliver asked for an effort, he found plenty. While also cheering him home from the mounting yard was his strapper Claire Skerman. Excited & thrilled just like everyone else, her elation was also met with tears – the happy kind due to an overwhelming sense of achievement. Having just strapped a winner at Flemington, the “Holy Grail” for all strappers, this win was extra special. Claire started out riding as a six-year-old in a local pony club, an achievement within itself as Claire suffers extreme scoliosis, a severe curvature of the spine. However not to be stopped, horses became her way of life and she began working in the racing industry after finishing school. But on the 27th August 2017, when Claire was riding her sisters’ horse in the arena, he started to buck uncontrollably, throwing Claire heavily to the ground. Claire’s’ Dad was luckily there to quickly call an ambulance. Knowing she couldn’t get up and with the pain in her back growing, her worst fear was realised when she was informed, she had serious fractures to her lumber spine. With surgery the best option, a rib was removed to repair her spine, and an intense recovery followed. A year for the bone graft to heal, months in a wheelchair, back brace, and rehabilitation to learn the simple things – standing up and walking again. With rehab & physiotherapy still ongoing, Claire began work at Cadet Lodge in July 2018 and the special gelding, O’Tauto was Claire’s first horse she strapped since being back at work. While proud owner/breeder Neville Murdoch of Larneuk Stud – home to O’Tauto’s undervalued sire O’Lonhro has also been excited by the young horse from very early days. With the Australian Guineas one possibility for O’Tauto; he could emulate his great great grandsire Zabeel back in 1990! The other is the hope of running in the All-Star Mile. Eurell said, adding that O’Tauto will be all the better as he matures. 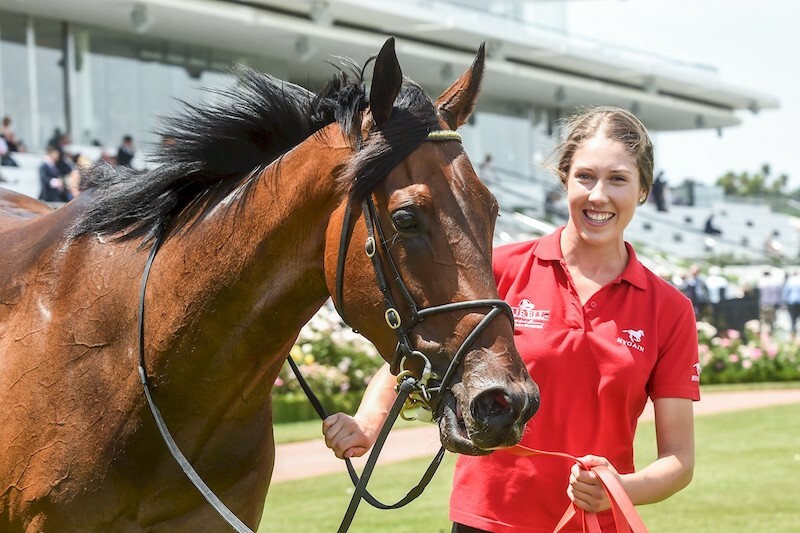 “He is going to grow into a lovely four-year-old and I am looking forward to seeing what he can do up 1600 metres,” Eurell said. The third winner in two days for O’Lonhro along with the consistent performers Moving On Up and Mr Bellagio, O’Tauto is the first Larneuk Stud bred foal for the lightly raced winning Strategic mare Taut. Having noticed that O’Lonhro’s sire Lonhro was doing an excellent job with mares by Night Shift, Murdoch secured the Night Shift mare Taut for only $800 and made her part of the Larneuk Stud broodmare band. Having produced lovely fillies by Ilovethiscity and Cluster, Taut is now back in foal to O’Lonhro who Murdoch continues to support with Group 3 Blue Diamond Prelude winner Faiza and multiple city winners Flying Empress and Go Missy. For further information on O’Lonhro who stands alongside Cluster, Honorius and Wolf Cry at Larneuk Stud please contact Neville Murdoch on 0418 105 706 or visit www.larneuk.com. NEXT POST: Australian Thoroughbred Wellbeing Survey needs your input! EARLIER POST: The Rewards keep coming!